A 64 year old male presented with one week of swelling in his right 4th finger. He was initially treated for a suspected bacterial infection, but did not respond to treatment and the finger was aspirated. The specimen was positive for fungal organisms. Note the flat powdery/velvety colony growth. It is common for the colonies to have a purple or lavender color with a white border. 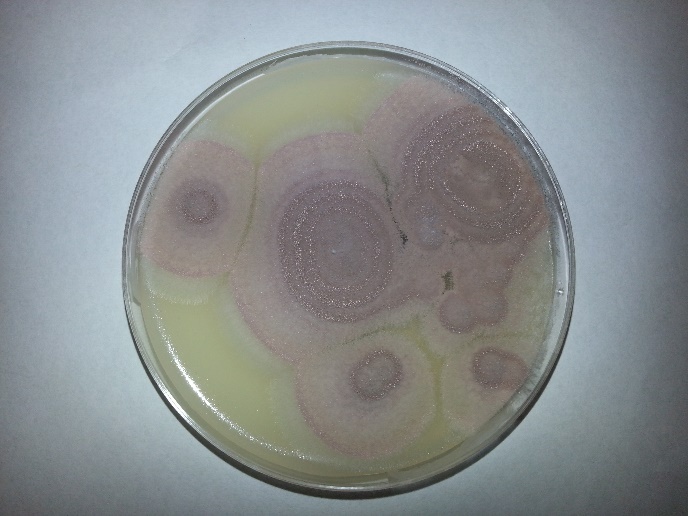 Purpureocillium lilacinum (formerly Paecilomyces lilacinus) is a fungus that is found ubiquitously within our environment, but has rarely been associated with disease in humans. A review paper in 2004 found 119 reported cases that implicated P. lilacinum from 1964 to 2004. It has been most commonly associated with ocular infections, often linked to intraocular lens implantations. There is scarce data concerning its susceptibility. In the event of a cutaneous infection such as the one presented in this case, it is recommended that posaconazole be used as first line therapy. 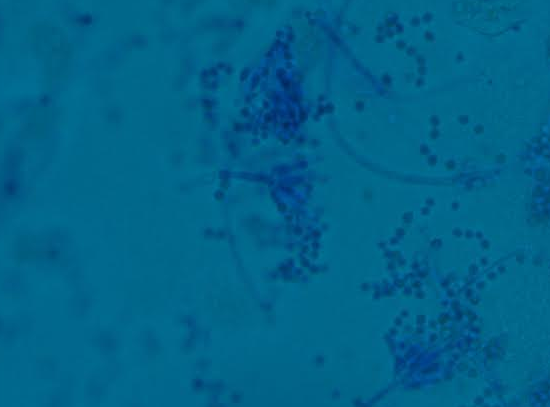 In the event of treatment failure, or intolerance, there is little data about which antifungals to treat with, though voriconazole has been shown to have successful in-vitro. The patient in this scenario had a history of undifferentiated spondylarthropathy, and was on methotrexate for a monoarthropathy in same finger in which the fungal growth occurred. He also received a cortisone injection into the joint adjacent to, but not directly into the site of the infection approximately a month prior to presentation. It could be possible that the cortisone injection had allowed the fungus to be inoculated into the finger, but we may never be certain. The patient also was gardening prior to his infection, and that could have also possibly contributed to his fungal infection. P. lilacinum is found readily in the environment, and should be considered on the differential of cutaneous infections. Though immunocompromised patients have historically been more susceptible, it has been reported in immunocompetent individuals and should be considered, especially in the event of failure of response to antibiotic treatment. More research needs to be done to better understand treatment regimens for this organism, though this is difficult as it has been difficult to test in animal models. -Rich Smith is a Pathology Student Fellow at University of Vermont Medical Center. Previous Previous post: Vitamin Deficiency or Acute Leukemia?